For the past 10 years I have been featuring Benny the dog on our annual holiday card. As most of you know, Benny crossed that rainbow bridge two months ago. As a farewell tribute to my little guy I decided to feature him one last time. After pouring through hundreds of photos of him I chose one as I like to remember him best – happy, healthy and living the good life. Enjoy some of the other cards that highlighted Benny’s good nature through the years. He was a very good boy. Carpe diem and Happy Holidays to one and all. Thanksgiving is all about food, fun, family, friends and giving thanks. I am thankful for the opportunity each day to have incredible, beautiful creatures in my life and to be able to share their uniqueness through my photos. Thank you for looking at my photo montage each week and thank you for your feedback. Madison the elder cat, the amazing two year old kittens, Audrey and Roberta and I wish you all a very warm, healthy and safe Thanksgiving. 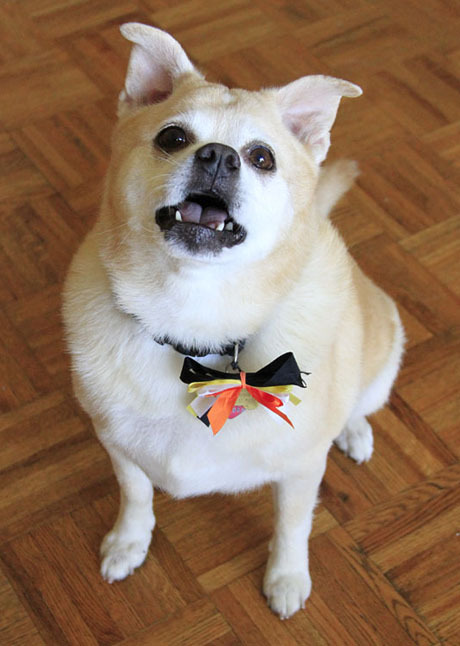 This is the first Thanksgiving in 10 years without our adorable Benny the dog . I give thanks for those 10 years that we had with him. A recent visit to New England to see good friends brought us to the nearby Stone Zoo. A wonderful zoo surprise was seeing a five day old colobus monkey clinging to its mother. The donations to the Binky Foundation in Benny the dog’s memory keep on coming. Thanking you all so much for remembering my sweet little guy in this way. My annual fall trip to see good friends in New England always includes a visit to Southwick’s Zoo . The autumn leaves, the chilly air and their wonderful collection made for a memorable visit. favorite animal foundation warmed my heart. He was a very good boy. These fun photos were taken last Sunday at the Central Park Zoo‘s photo class. Come join us for another in our Photo Series on January 24th from 8:30 to 10:30 as we have Breakfast with the Birds in the warm Tropic Zone. Get details and sign up here. On a personal note I want to thank all of you who responded so warmly to Friday’s post, Benny – In Memoriam. I truly appreciate all of your thoughtful and sympathetic words. I miss the little guy. When I returned home from bringing Benny to the Vet to be cremated, the entire apartment building staff was waiting for me in the lobby to give me hugs and support. He was a building favorite and loved getting treats and hugs from the doormen after our walks. I spoiled him with toys, treats and trips to our favorite stores. Our daily walks allowed me to meet my neighbors and he had a host of friends in the ‘hood, both two and four legged. I interrupt the usual Sunday Zoo photos to bring you photos from the 2015 US Open where I enjoyed a few days of tennis life and work. The action is great, the sun is hot, and it is a fun change of pace. 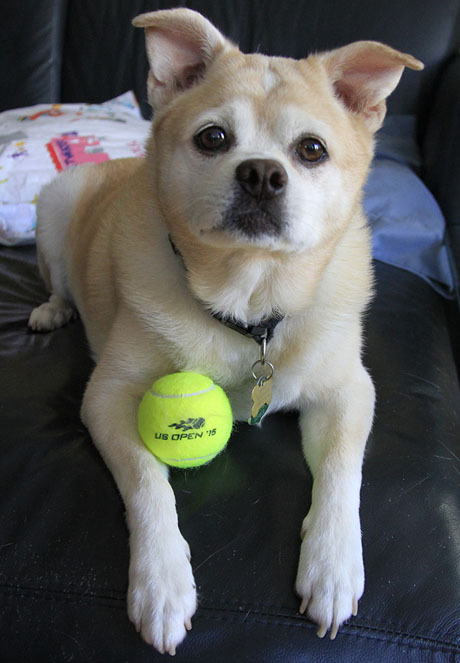 And yes, that’s my dog, Benny, above – enjoying his US 2015 US Open tennis ball at home. For all of those camera enthusiasts out there, I’ll be running a Fall Photo Workshop at the Central Park Zoo on October 25 from 8:30 to 10:30. 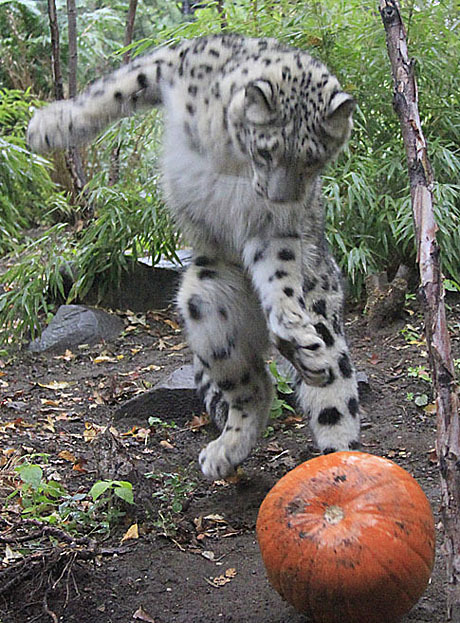 I will arrange some special pumpkin and other activities so you can get great animal shots. Here is a link to last year’s photos from the same event. I take a lot of photos of zoo animals but take even more shots of my own brood at home. Enjoy a summer zoo photo break with Benny the dog, Madison the elder cat, and sisters Audrey and Roberta who are almost two. 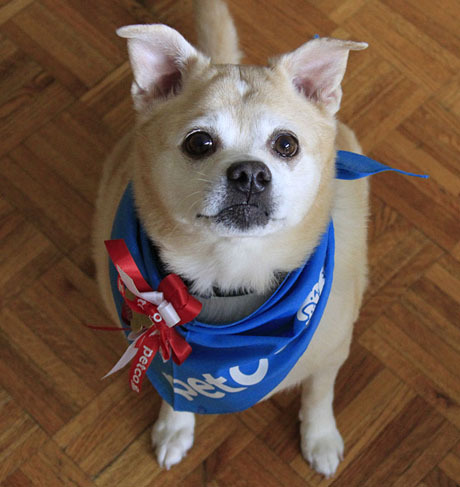 Today is 10 years since I adopted my dog, Benny. Those of you that have met him know that he is special. 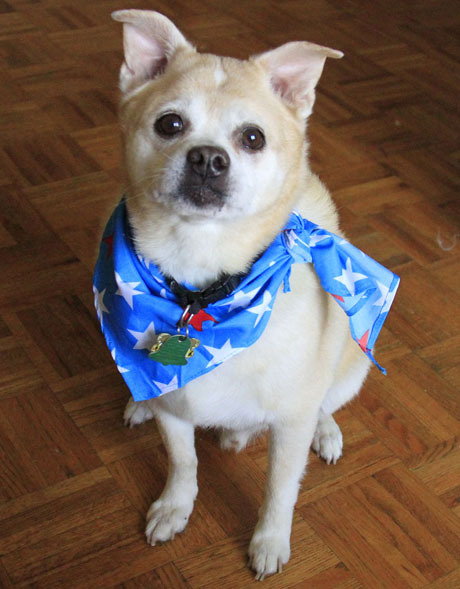 Other than that I am not sure how old he is or what he is – we think he is a combination chihuahua/pug/terrier/bat/truffle pig and a few other things thrown into his DNA. He barks when the phone rings thinking it is someone at the door. He has too many toys (my fault) and gets too many treats (mea culpa as well). He knows everyone on the block and his presence has allowed me to meet tons of other people in the ‘hood’. He loves to go shopping at Petco, Staples, Barnes & Noble and Bed Bath & Beyond with me and has met many new friends in those stores too. There is something about the little guy that makes people smile – and that’s a good thing. Nary a day goes by that someone does not stop me and ask ‘What kind of dog is that’? My usual response is ‘He is something special’. Good boy! It feels really good to start to feel the warmth of the spring sun on one’s face. The icy cold of winter is fading and we are all feeling the exuberance of spring. 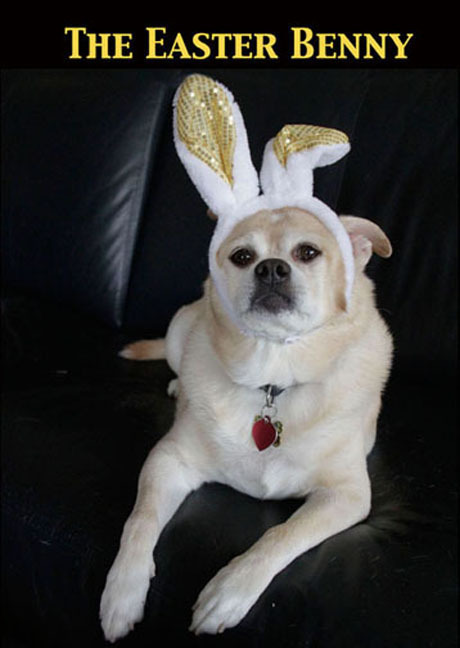 Oh – and yes, that is Benny the Dog in all of his Easter splendor.